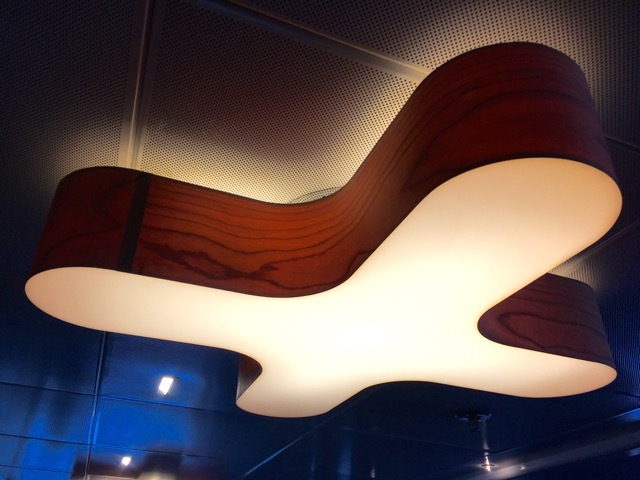 “The idea was to create something like a top-notch hotel feel,” quotes The Mercury of Richard Nilsson, the Swedish designer behind the new look of the twin Spirit of Tasmania ferries which travel between Port Melbourne (Victoria) and Devonport (Tasmania). Having received permission to come aboard (you had to apply in the week or two before the Open Day) we decided to catch a tram (well, two trams) across town to Port Melbourne. The route 109 tram stops about 100m from Station Pier. Given we live pretty close to a tram stop, and the high likelihood of experiencing lots of bother trying to find a park had we taken the car, tramming it was definitely the way to go. Cool! Stilt walkers, balloons, and mini SoT’s! Getting excited now! There’s the big ship! I’ve never walked through here before! 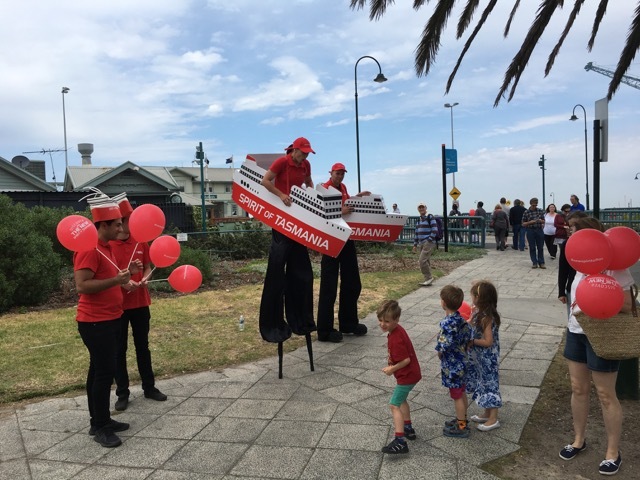 There weren’t queues, but enough people were wandering in the right direction so it was unlikely anyone was going to get lost – even if there hadn’t been plenty of red-shirted, boat-hatted people greeting people and making sure we didn’t get lost. 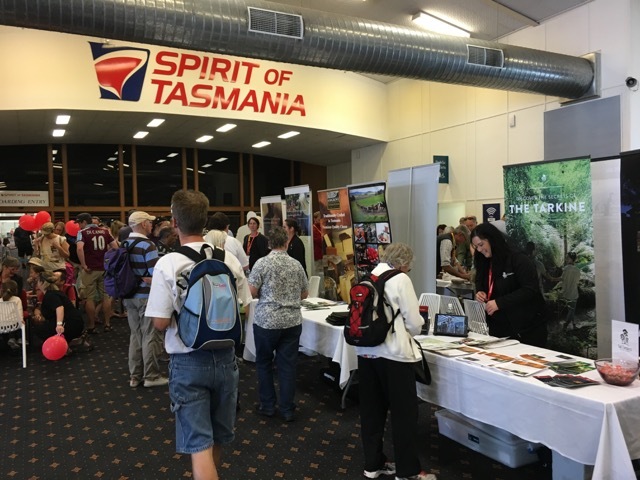 Up in the check-in lounge there were a dozen or so Tasmanian tourist stands, to whet the appetite of prospective travellers. Passing by all the photos in the hall I started to feel the usual excitement I get when we board the big red boat. Pity we weren’t sailing off to Tassie today! Ooooh! How exciting! Everything is about to be revealed! Oooh, I almost feel like I’m in Crown Casino! First change – no tourism shop. Now there’s a Tourism Hub. There is a desk to the left where (hopefully) a staff member will be there to answer any questions passengers have. Walking up the port (left) side of the ship there is now a BYO Library (officially named the Reading Room) where there used to be The Leatherwood Restaurant. Clearly this area is for quiet activities – if you want to make noise, there is plenty of space on upper decks. Next to the library is the new reception area. I wouldn’t have chosen red, and continuing red along the corridor seemed a little over the top, but hey – that’s just my opinion, and it’s just a small area of Deck 7. The Pantry has also kicked out the pokies! And I can’t say I’m sorry to see them go. It was the only inclusion I really disliked about the previous layout of the ships. 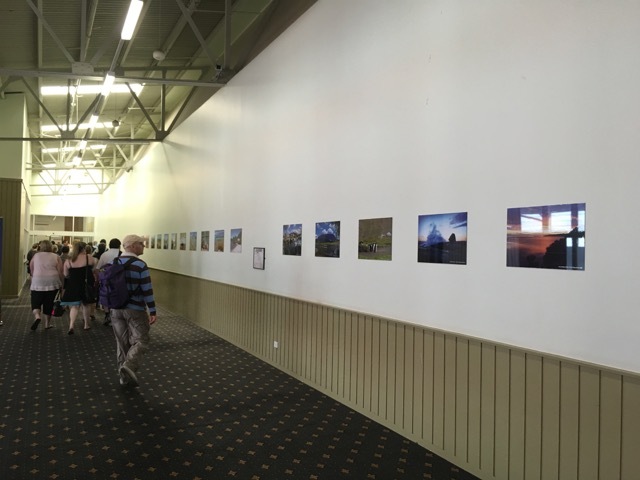 Ahead was more lounge area, with a touch of blue, and lovely Tasmanian scenery instead of TV screens. 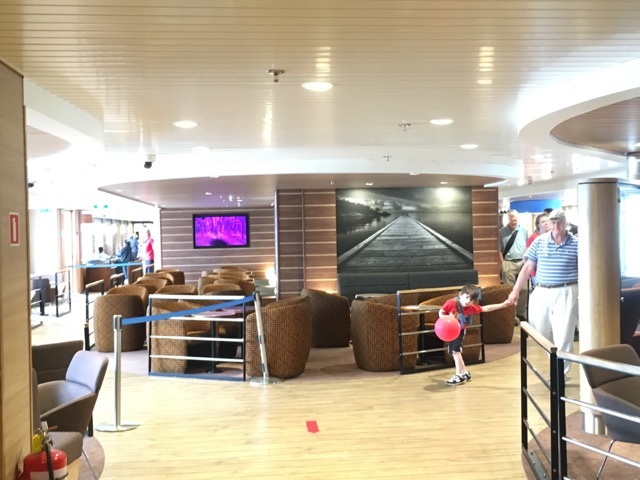 The old reception area is now also lounge, as is where the shop (Tasmania Onboard) used to be. It’s a nice day to be on the outside deck, and there’s a ship along-side us! …before finally getting a look at the new dining area. Goodbye Captains Table. Hello TMK (The Market Kitchen)! No more table service and white table cloths, I’m afraid. Now we’re all taking a tray and loading our own plates, I think. The menu looks familiar, but I wonder how long it’ll last. As for the condiments rack? Hmmm, classy. 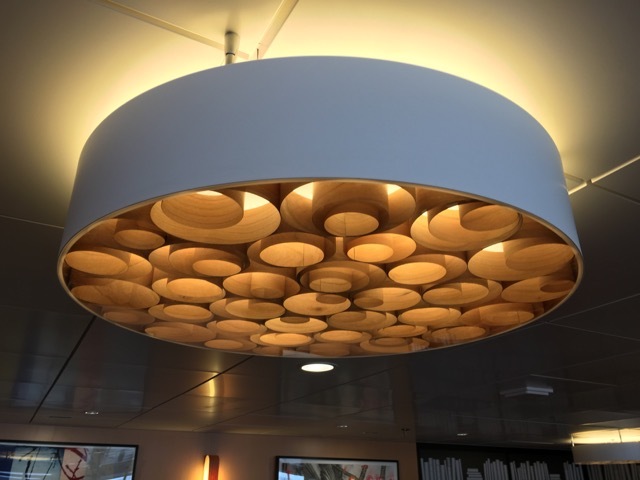 I think this light was there previously…? Well, that’s Deck 7 covered. Sleeping, eating, and a bit of lounging. Unless you’re sleeping on Deck 8, there won’t be much there to see for you – unless you’re here on an open day! So, check it out! The Recliners have all been replaced. I had a brief sit in one. 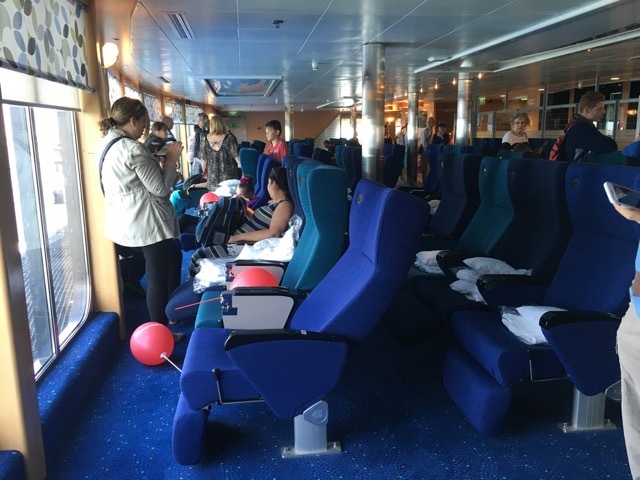 It felt pretty good, but I’m not in a hurry to give up booking a cabin in favour of the ‘cheap seats’ – especially as I like having a shower at least once every 24 hours. But if you’re not so fussy, and if you’re not taking a whole pile of luggage with you (or planning to bring a lot of souvenirs back), then these might be the best option for you. Moving up to Deck 9 now – brace yourselves! Well, they said it would be different. It’s all to encourage more day sailing passengers. 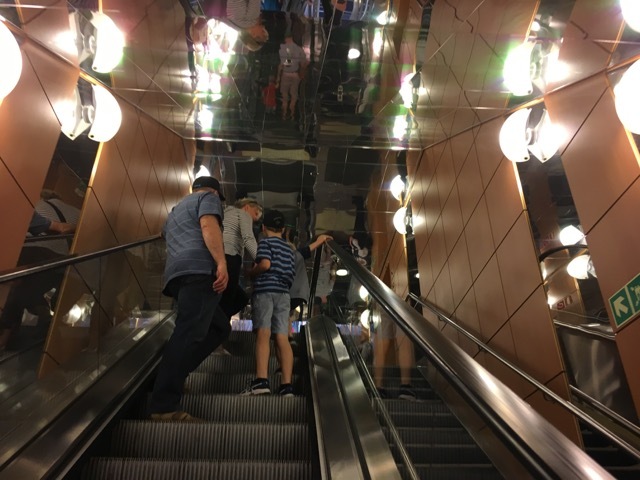 I thought I’d discovered the pokies, but no – it’s a different gaming space! Deck 9 always felt more weather tight than Deck 10, so having lounge areas here wasn’t too surprising. But would there be more of the same upstairs? Well, no. It was More. I’m sure they’ve thought about things sliding around in heavy seas. Of course they have. Because not every sail is a pleasant day like this one was. Now how do you get everyone up on Deck 10 to come down again? Send up the band! They were very good, and I’ll wager that most of the people upstairs followed them to see where they went, not knowing that we were being surreptitiously being escorted out. Playing and walking down the stairs was quite a trick. I’m not sure where the trio exited, but we had to walk down to Deck G3; this is usually a cargo/freight deck. Cars are usually parked on Decks 5 & 6, sometimes Deck 4 if it’s really busy. And that was it! 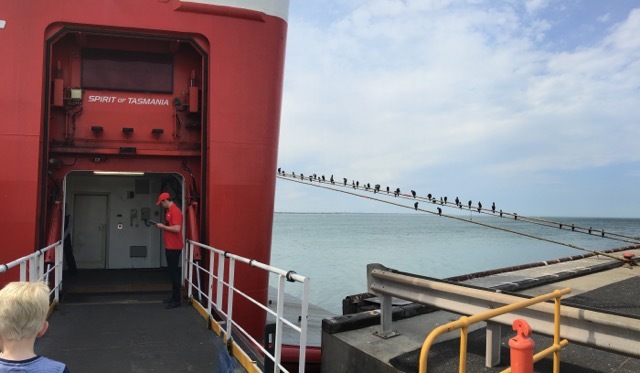 We disembarked at ground level and were treated to a fantastic sight of the Spirit of Tasmania – you may recognise it from their ads. I find it fascinating the way the sides at the front also come away from the ship. 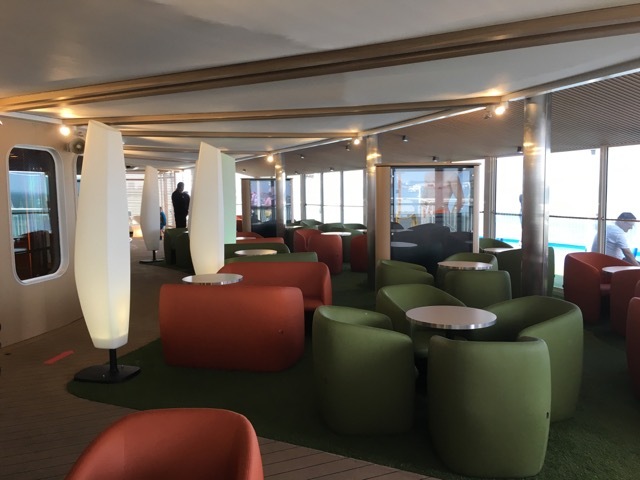 Bass Strait is not the Mediterranean; the weather ranges from windy to blowing a gale, so the ‘bringing the outdoors in’ idea with the use of the fake grass and garden furniture struck a chord that didn’t resonate true with my memories of previous crossings. I didn’t test the furniture to see if it was bolted to the floor, but there is a lot on Deck 9 & 10 that looked like it wasn’t secured. If bad weather is forecasted, there may be a lot for the staff to put away for passenger’s safety. It’ll be interesting to see how long this lasts. Ditto with the bars on those levels. I was advised that the Bars on Decks 9 & 10 would be open for day sailings (as you’d expect) and winter sailings (for at least a few hours. Something to watch with interest. I certainly hope that Deck 10 is a little more air-tight now, as it used to get a bit chilly up there during winter. We are both very sorry that The Leatherwood restaurant has been scrapped. Having only one sitting a night did not improve profitability, but the demand was certainly there to do two sittings – even in winter. Now, instead of racing to get a restaurant reservation, I wonder if we’ll be hurrying to get a small table for dinner – despite the expanded dining area. It’ll be interesting to compare our next voyage to our previous experiences. 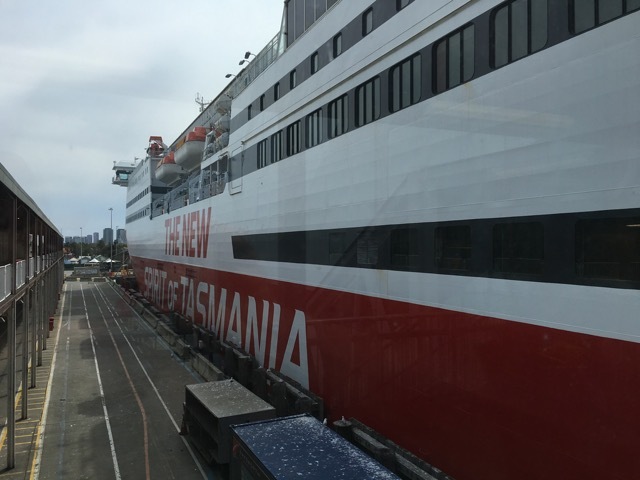 You can check out the official time lapse videos and information about the refurbishments on the Spirit of Tasmania website. Categories: Holiday, Tasmania, Who Knows What | Tags: Bass Strait, Devonport, holiday, Port Melbourne, Spirit of Tasmania, Station Pier, Tasmania, TT Line | Permalink. A comprehensive review Dayna. I started to get excited too about the possibility of going to Tassie! I haven’t been there by water and I think it’d be a good way to go. You’ve put your finger on it. I think they’re trying to make it look more like a cruise ship to make it more appealing for day sails. It’s about 9hrs each way – so far I’ve been happy to be rocked asleep for the majority of that. We’ve contemplated doing a day sail (available high/summer season only) but haven’t wanted to ‘waste’ a day of holiday on the ship, potentially quite bored and frustrated with fellow passengers. They’re not all like the ones in the professional photos. And you know us – happy to get AWAY from crowds…. 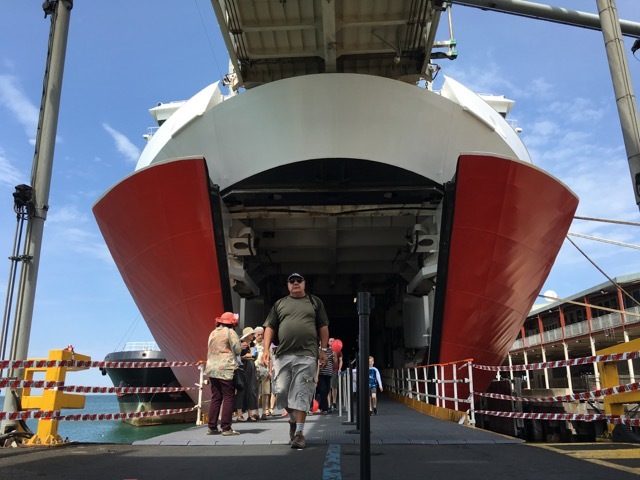 The face lift looks amazing and couldn’t agree more – they are trying to make it look just like a cruise ship and, let’s face it, you do ‘cruise’ across the strait, albeit Dean and I did it at night both ways, sleeping like you do. Thanx for sharing your wonderful photos – who knows when I’ll get the chance to be on the SoT again. True, it is something of a very short cruise, Clare, but on a windy winter’s night (or any season for that matter, but the roaring forties are particularly strong in winter) I will be amazed if it ‘works’. Still looking forward to trying it out. Thanks for dropping by – I know I have caught up with everyone else in so long. 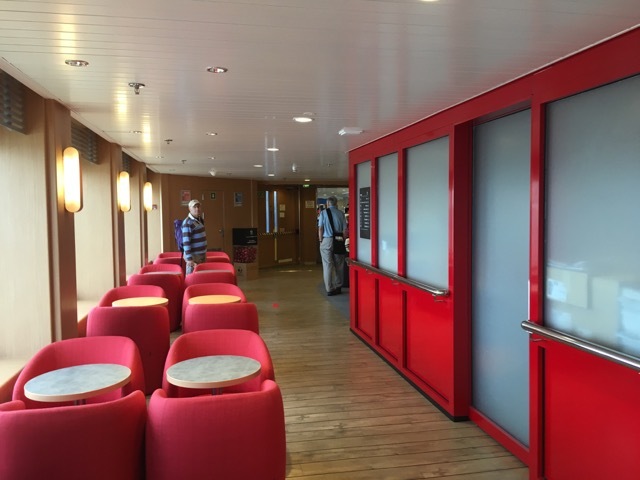 My only experience of Ferries is on Brittany Ferries from Roscoff to Plymouth. About eight hours. It is like a mini cruise, a bit of an adventure. But I do prefer the white table cloth dinner or breakfast for a bit of luxury, and really not expensive. I never fly, so it’s the only way that I am ever going to go anywhere, except by road. We find it’s generally more relaxing, something different, and of course it’s the only way we can take our car across! Thanks Amanda! I’m glad they are so convenient for us to use. I really enjoy going over by boat. It looks good I can’t wait to try it out although like you I’ll shell out for a cabin rather than a recliner. I used to like the upper decks in the colder months as you could get away from everybody so it’ll be interesting to see what happens now, I think if there is no TV’s up there a lot of the punters will probably still stay down on the lower decks at night ( I hope!). Shame about the restaurant and the visitor centre, I wonder if you’ll be able to buy a National Park Pass on board now, it was handy to be able to get one on the ship if I was heading into the hills as soon as I got of the boat in Devonport. Thanks for the post it was very interesting. Oh no, Kevin, there’s no escaping from TV screens now! They’re on every deck! Of course if no one goes up on 9 or 10 in winter maybe they’ll turn them off, but we’ll see. Good question about the NP passes. There will be staff at a desk at the Tourism Hub, but not sure if they’ll do passes (one would hope so! ), or how long the desk will be open. We buy two year car passes and live in hope. It’s not too expensive and goes to a good cause, I think.